Ganesha has long been a Source of Balance; allowing Peace and Flow; undulation of Life Force expressing through Humanity. 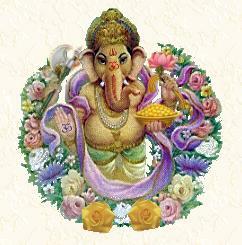 I want to honor the great Archetype of Ganesha, Lord of Beginnings and Remover of Obstacles. The elephant-headed god has been a great Teacher to me. As we approach the Winter Solstice of 2010 I am inspired to find the ways that I will bring Light into my own environment, my Being, to those I love, and all Life on this planet. I realize again the gentle teachings and protection Ganesha embodies and brings to all People, and look to Him as I often do, for Principal and Example. This en-lightening fact brings Ganesha's archetypal lessons and influences more strongly into my reach...into my awareness in such a way that I can see in my mind's eye, and feel in an intriguing, amazing way...the Oneness of myself and a being called Ganesha; it reminds me that nothing in this universe is impossible or separate; the subtle parts and bodies that connect everything, running into and over each others' borders...then even more, that no borders exist at all, and the melting into and out of Form is the habit and pattern of every aspect and molecule of Life. I feel a beaming quality in my Heart, Heart Channel, and Heart Envelope when I perceive in this way. I know this to be Ganesha's smile as He acknowledges human appreciation for His Boone. A boone is a Gift. Shri, Shri, Ganapati. And how, you ask...does he come to have the head of an elephant?? There are more than one explanation of that point. The one that my Teacher told us was that Ganesha's mother, Parvati, went into the bath and told her son to guard her privacy at the entrance. Ganesha took her very literally, and when the great Shiva, his father, wanted to pass, Ganesha blocked him from entering. In a rage, Shiva cut off his head!! His heartbroken mother vowed that the very first animal that passed would donate his head to Ganesha...and an elephant happened by...and there you have it! "Probably the most popular god in all of India is Ganesha, god of wisdom and patron of sciences, arts and creative activities. With a figure made up of both man and elephant, he represents the microcosm and the macrocosm. The elephant is a symbol of the human potential to become enlightened. The rat he rides upon is able to pass anywhere. Ganesha is the son of Shiva and Parvati. Parvati entreated Shiva to beget her a son, but Shiva would hear nothing of it. He had no desire, he said, to be a householder [responsible for a family], for such a state is troublesome. Seeing Parvati's distress at this, Shiva pulled a thread from the dress she wore and made a son from it. Parvati suckled the babe at her breast, and he came to life. As he suked at her milk he smiled, and Parvati, pleased, handed the son to Shiva. Shiva was surprised that Parvati breathed life into a child made of fabric and warned her that the birth of the child was inauspicious. As he spoke, the child's head fell to the ground. Parvati was overcome with grief as Shiva tried unsuccessfully to put the head back on the child's body. Suddenly a voice came from the sky and said tht the head of someone facing north would stick to the child. Shiva sent Nandi, the bull upon which he rides, to find such a person. Nandi soon found Indra's elephan Airavata lying with his head facing north. He began to cut it off. Indra tried to stop him but Nandi was successful, although one of the tusks was broken in the struggle. Nandi took the elephant head to Shiva, who placed it upon the child. Thus Ganesha was born. The gods celebrated the birth and Parvati was pleased. "This is a Hindu themed design I created based on Ganesha, (or "lord of the hosts," also spelled as Ganesa and Ganesh, often also referred to as Ganapati). 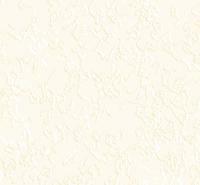 Ganesh is one of the most well-known and venerated representations of God (Brahman). Ganesh is the Hindu lord that is considered the master of intellect and wisdom. Ganesha is a much beloved and frequently invoked divinity, since he is the "Lord of Good Fortune" who provides prosperity and fortune and also the "Destroyer of Obstacles" of a material or spiritual order. There are many classical ways to depict Ganesh. The Ganesha graphic on this page, sometimes referred to as "Siddhi Ganapati" or "the Accomplished," is the epitome of achievement and self-mastery. He is holding a lotus and prayer beads, an axe, and a bowl of modaks (modaks means "That which gives (or brings) happiness") his favorite sweet." Ganesh Chaturthi is the birth anniversary of Lord Ganesha. The festival celebrating Lord Ganesha's birth is called Ganeshotsav. This typically comes sometime between 20th of August and 15th of September. The festival lasts for 10 days. There are about 91 different figures of Ganesha according to research done by several scholars. The details of their make up vary from figure to figure, but the main form stays the same. In every Hindu function, invocation to Lord Ganesha for His blessings takes precedence over all other gods to ward off any mishap. 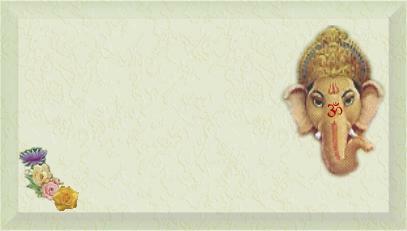 Every part of Ganesha's body, such as ear, nose, eyes, trunk, has some significance. Ganesha is the first sound, OM, in which all hymns were born. He represents the perfect equilibrium between force and kindness and between power and beauty. He also symbolizes the discriminative capacities which provide the ability to perceive distinctions between truth and illusion, the real and the unreal.